anodized & laser etched for long lasting good looks. Includes stainless steel washers, USA made o-rings & the good push-rod tube seals. Set you motor off with this great product! This bolt-on mid transmission mount stops nose cone breakage and is easy to install. It bolts to the intermediate carrier studs on any Beetle style tunnel transmission. The urethane stops locate pressed up to the bottom of the transmission frame horns. This mounting kit eliminates the upward pressure exerted on the front nose cone under hard acceleration. This kit includes premium Fast Fab urethane pads, laser cut plate welded to a cnc machined tube section. Finally we powder coat in light texture black for long lasting good looks! ere to edit. Made in USA. These CNC machined fuel pump block offs are made from billet aluminum. 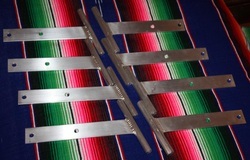 They are finished in anodized colors & laser etched for long lasting good looks. A very clean look to complete your motor. Control oil pressure with this new externally adjustable remote bypass oil system. Excess oil pressure common in performance motors is hard on bearings and will decrease the life of your engine; this system solves that problem by bleeding off pressure and returning it to the sump before it has the chance to cause damage. 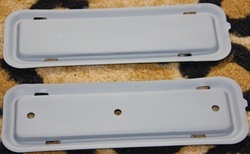 Parts are sold in sets of 4 (front and rear) and come in raw alloy finish. ​These are made in Fast Fab's California facility. Construction is all Aluminum and TIG welded for a great looking product. The box is designed to vent from the sides instead of the top like all the other brands. removed and cleaned without taking anything apart. We have used these breather boxes on our own and customers cars, on a street car they do just fit with full dog-house cooling and any carb combo. Made to customers specifications, approx 4 week delivery time, price varies. Please contact us to discuss you requirements. Example shown here, with separate breather box on side for Berg 5 speed. These are manufactured in Fast Fabs California facility to factory specifications. They have really worked hard to ensure a nice part that will fit your cars dash opening just like the factory part. This CNC machined remote oil filter mount is machined from billet aluminium, laser etched & anodized for long lasting good looks. Thread is 3/8" NPT. Set you motor off with this great product! These CNC machined oil cooler block off plates are machined from 6061 aluminium, anodized & laser etched for long lasting good looks. Includes stainless steel hardware. These work great for anyone looking to eliminate the stock cooler & use a remote cooling system. This CNC machined oil pump cover is machined from billet aluminum & anodize finished. Thread is 3/8" NPT. Designed to prop open the bottom of early decklids. Includes allen screws to fasten to car. 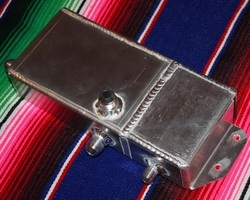 Designed to keep your carb linkage, dual carbs, throttle bodies or air cleaners from touching your decklid. Helps improve cooling. 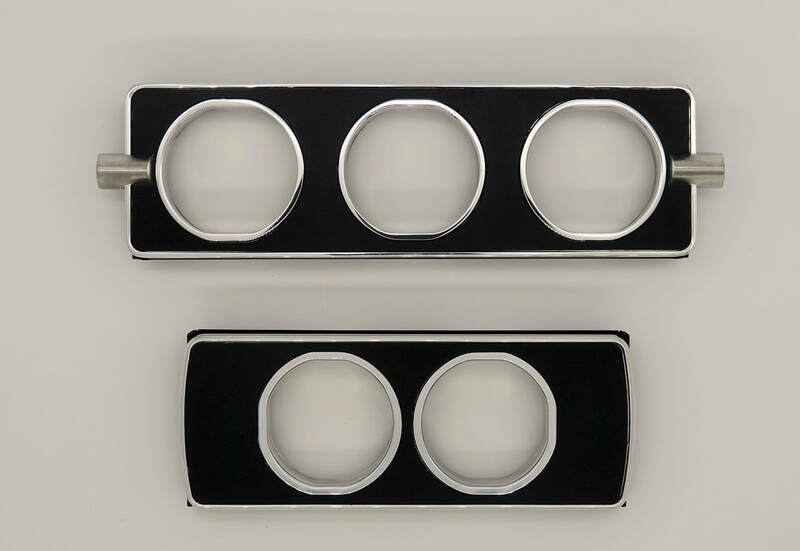 Stand-off will prop open the bottom of your decklid 3"
These gauge panels are designed to mount in your factory radio hole without any modifications to your dash! All gauges mount behind the panel & are held in place with a metal back plate. The Steel insert is paintable (so you can color match to your dash) or use the panel with the matt black powder-coated panel provided. Also included trim parts that match your factory trim on the glove box and fuel gauge surround giving your car a look that could have come from the factory. This product includes all parts needed to install in your car. BASIC KIT DOES NOT INCLUDE GAUGES. '65 to '67 (no drilling) Made in USA. This is the perfect way to add a tach to your bug without cutting the dash. The bracket bolts into the centre defroster vent & positions the tach just right. 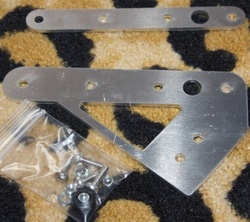 Parts include all hardware and are sold in raw alloy finish.